See Paris Modistel /Paris Modiste (1956) for contrast and reference. Like most H carres of the 1950s, this has a white contrasting roule. Posted on Thursday, August 21st, 2008 at 1:34 pm	under Carres - 1950s, Grygkar, Untitled Carres	. 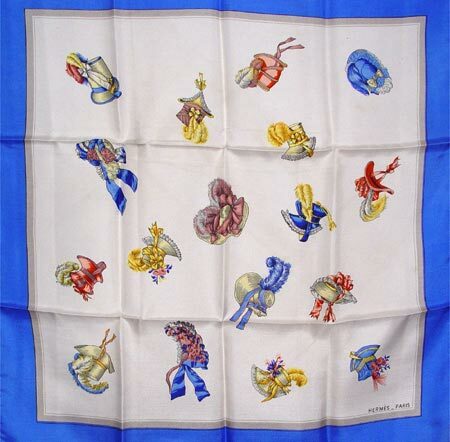 Hi, I was wondering why sometimes this scarf is called Modiste, and other times it is called Modistel. Is it true the name changed when it was re-issued in 2006/2007? If so, do you know if it was changed from Modiste to Modistel, or the other way around? Also, I tried to click on the link you provided above for more information on this scarf, but I wasn’t able to access the page. Thanks in advance. I believe that it was changed from Modistel to Modiste but not specifically for the 2006 issue. You can find very old versions spelled BOTH ways.